The Gateway Festival Orchestra performs free concerts in July. Because the Brookings Quadrangle will be unavailable due to construction, we are moving three of our four concerts to the 560 Music Center, located at 560 Trinity in University City. We suggest you join us at 7:10 p.m. prior to each concert for our pre-concert series, Notes to Munch On, to meet the artists and to take a glimpse inside the music. Take I-64 / US-40 east to Big Bend Blvd and turn left. Take Big Bend Blvd north to Delmar. Turn right on Delmar. The 560 Music Center is located on the right at Trinity Ave and Delmar. Take I-64 / US-40 west to Big Bend Blvd and turn right. Take Big Bend Blvd north to Delmar. Turn right on Delmar. The 560 Music Center is located on the right at Trinity Ave and Delmar. Take I-44 east to Jamieson, turn left. Turn left on Arsenal. Turn right on McCausland. Continue on McCausland (it changes into Skinker at Clayton Road.) Continue north on Skinker to Delmar. Turn left on Delmar. The 560 Music Center is located on the left at Trinity and Delmar. Take I-70 east to I-170 south. Take I-170 south to Delmar. Turn left on Delmar. The 560 Music Center is located on the right just past Big Bend Ave at Trinity and Delmar. Take I-55 north to I-44 exit (west). Take I-44 west to Hampton Ave and turn right. Take Hampton north to I-64/US-40 west. Take I-64/US-40 west to Clayton/Skinker exit and turn right on Skinker. Take Skinker to Delmar and turn left. Take Delmar west to Trinity Ave. The 560 Music Center is on the corner of Delmar and Trinity Ave. There is a shared parking garage with COCA, which offers complimentary parking on a first come, first served basis. Entrance is behind the building on Washington Ave.
Drive into the driveway off of Trinity and find several handicapped placard parking spaces (or drop off) there. There are also handicapped parking spaces in the garage – entrance on Washington Avenue. Enter on Trinity Avenue for a no step access to the hall using the elevator. Parking is available at various locations in and around Central Park. These locations include the Central Park main parking lot at Lydia Hill Drive and Veterans Place Drive, street parking on Veterans Place Drive, Lydia Hill Drive and Burkhardt Place Drive. There is also additional parking at Chesterfield Mall. 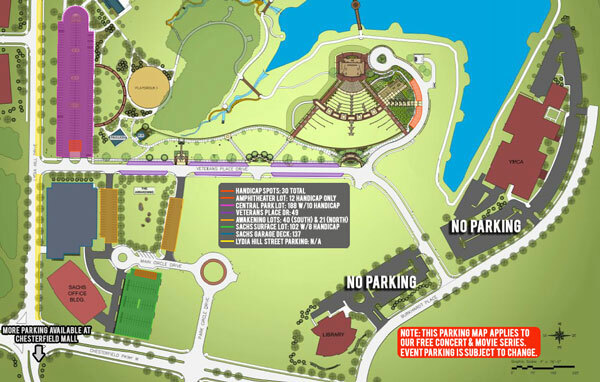 Accessible seating and parking is available for all events at the Chesterfield Amphitheater. Be sure to join us at 7:10 p.m. prior to the concert for our pre-concert series, Notes to Munch On, to meet the artists and to take a glimpse inside the music. Be sure to join us at 6:10 p.m. prior to the concert for our pre-concert series, Notes to Munch On, to meet the artists and to take a glimpse inside the music.